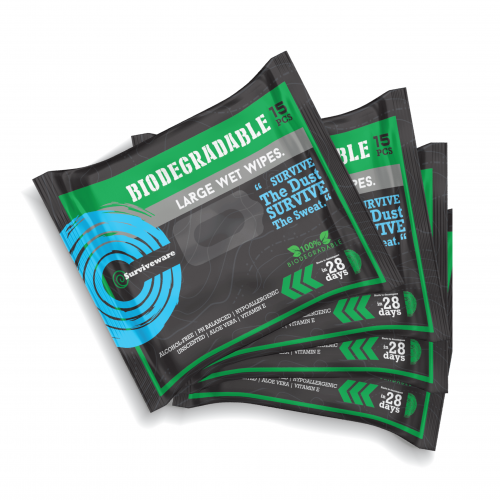 Surviveware, a leading adventure and survival gear brand, has launched travel-sized Biodegradable Wet Wipe packs. Adventure enthusiasts rely on Surviveware’s Biodegradable Wet Wipes for their hygiene and preparedness needs. However, bringing the whole package of 32 wipes may be cumbersome for those traveling with weight limitations. Hiking and camping activities require adventure-seekers to pack light and bring nothing more than the essentials. Their supply of gear should not only last the entire trip, but also have a calculated excess for unexpected events. This holds true for hygiene products as well, which should be lightweight without sacrificing effectiveness and functionality. Surviveware’s newly released wipes are preserved inside pocket-sized pouches. Every order of Surviveware Biodegradable Travel Wet Wipes comes with four packs, each with 15 wipes (for a total of 60 wipes) that are small enough to fit in pockets. Each package contains 15 moisture-enriched sheets that dry nicely on the skin. Since the sheets come in smaller resealable packs, users are assured that they have a means for cleaning sweat and odor anytime, anywhere, even when stealth is required. Like its larger counterpart, Surviveware’s new pocket-friendly Biodegradable Wet Wipes- are still 8” x 12” which is perfect for giving hikers a wider surface coverage. Moreover, being three times larger than regular baby wipes makes these wipes a more economical choice for hikers and travelers on a budget. These portable wet wipes contain a hypoallergenic formula which is perfect for individuals with sensitive skin. Moreover, the wipes are alcohol-free and have naturally soothing aloe vera and vitamin E that effectively nourishes and moisturizes the skin. The soothing ingredients infused in these wipes prevent skin irritation and drying due to prolonged use. Despite its all-natural ingredients and gentle formulation, the wipes can remove caked-on mud, sweat, and grime from one’s body. The wipes are 100% biodegradable and begin to decompose within 28 days after use, compared to regular wet wipes which can take up to 100 years to break down. Make the most out of your hiking, camping, hunting, and boating adventures with the new Surviveware Biodegradable Travel Wet Wipes, which have just been released on Amazon. Grab your pack now and experience the freedom of having biodegradable wipes in pocket-friendly pouches. Get your Surviveware Biodegradable Wet Wipes now by clicking here. Limited stocks are available.